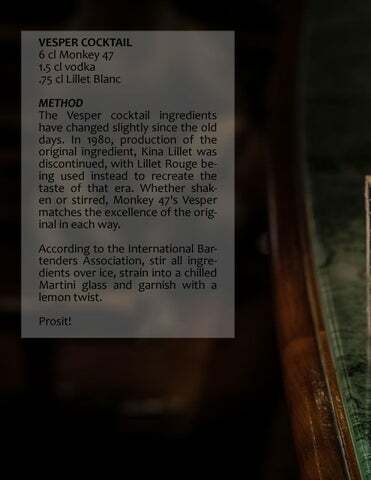 VESPER COCKTAIL 6 cl Monkey 47 1.5 cl vodka .75 cl Lillet Blanc METHOD The Vesper cocktail ingredients have changed slightly since the old days. In 1980, production of the original ingredient, Kina Lillet was discontinued, with Lillet Rouge being used instead to recreate the taste of that era. Whether shaken or stirred, Monkey 47's Vesper matches the excellence of the original in each way. According to the International Bartenders Association, stir all ingredients over ice, strain into a chilled Martini glass and garnish with a lemon twist. Prosit!